Santa Monica, Calif. : Getty Research Institute for the History of Art and the Humanities, 1996. First Edition. Fine copy in the original color-printed, stiff-card wrappers. Particularly and surprisingly well-preserved; tight, bright, clean and especially sharp-cornered.
. Series; Texts & documents. Physical description; 273 p. : ill. ; 26 cm. Notes; Translation of the original German published: Munich : Drei Masken Verlag, 1926. List of author's works: p. 239-261. Includes bibliographical references (p. 226-231) and index. Translation of Der moderne Zweckbau. Munich : Drei Masken Verlag, 1926. Contents; No longer a facade / but a house -- No longer a house / but shaped space -- No longer shaped space / but designed reality. 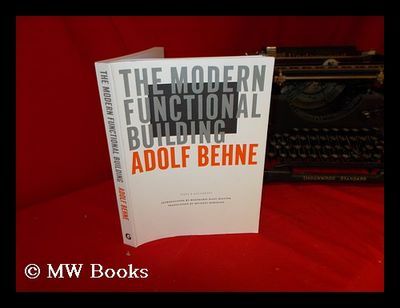 Summary; This text on German architectural theory, written in 1923, sought to clarify the ideals and complexities of German modernism - especially the distinction between functionalism, rationalism, and utilitarianism. It should be of value to those interested in this phase of the modern discourse. Subjects; Functionalism (Architecture). Architecture, Modern  20th century. Architecture, Modern  20th century  Germany. Architecture  History  20th century. Architecture - [20th Century - Europe - 1920s]. Architecture, Modern. Modern Architecture. Buildings. Functionalism  Germany. Architecture  Theory and criticism. Architecture  Germany  (1900-1924). Architectural structure & design. History of art / art & design styles. Germany. Inter-war period, (1918-1939). Architecture / History / General. Architecture ; History of... ; Germany. Behne, Adolf. Genres; Bibliography. Illustrated.